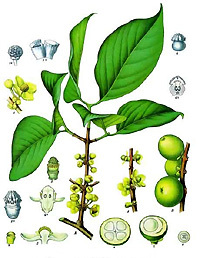 Gum gutti (gummiresina guttae in Latin, also known as gamboge, gummigutta, gutti, from the Malayan getah = latex), is both a gum resin and the dark mustard-yellow plant dye that is obtained from it. The pigment is obtained from the latex of trees of the Garcinia genus (Garcinia hanburyi, Garcinia morella) which are native to Cambodia, Mysore, Sri Lanka and Borneo. Historically the product traded in Europe came from Siam, being shipped via Singapore or Canton in China. To obtain the dye, spiral-shaped incisions are made in the bark of trees that must be at least 10 years old, or leaves and shoots of the tree are broken off. The yellow latex exuded is caught in bamboo tubes. When the tubes are broken the latex, now hardened, is extracted in the form of brown sticks ("stick gutta"); a darker, inferior product in the form of lumps has also been marketed ("cake gutta"). The raw resin consists of ca. 70-80% dyestuff and 20-30% rubber. Gamboge is partially soluble in alcohol, oil or water, though in each medium either just the rubber element or just the dyestuff element will be dissolved. The pure dyestuff, which has a dark, mustard-yellow transparent colour, can be obtained by dissolving the resin in a large quantity of water and then drying it. In the Middle Ages it was used for book illumination, as an application medium for gold leaf and as a coloured pigment that was substituted gold (gold varnish). Today it is rarely used. On a less wide scale, gamboge also found a use as a powerful laxative. Excessive doses however are toxic, so it continues to be used today only in veterinary practice.